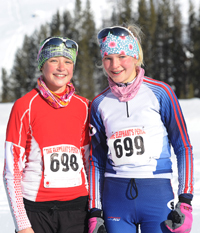 Jan. 5, 2013, the Baker Creek/Prairie Creek Snowmaker cross-country races north of Ketchum—sponsored by The Elephant’s Perch of Ketchum with the support of the Blaine County Recreation District, Sun Valley Ski Education Foundation and volunteers. A total 99 skiers, 58 male and 41 female. Finishing times in minutes and seconds, with age after a racer’s name. Average age was 52 among the 43 finishers on the long course.